Wicker is enjoying a little revival these days, and we couldn't be happier. With its earthy, handcrafted texture, organic forms and its natural vibe, there's a lot to love. Before we dive into a round up of some of our favorites, let's talk history for just a second. 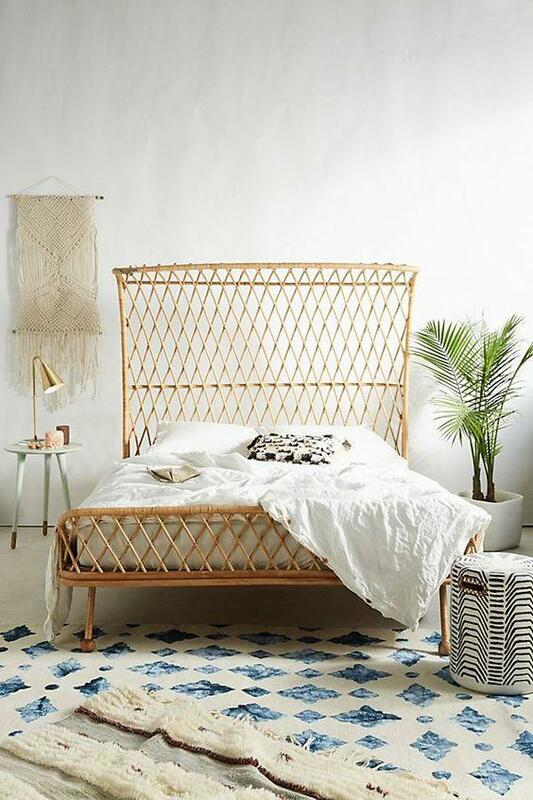 While mention of wicker furniture may immediately conjure up visions of your mama's painted white porch furniture, we need to clarify that the term "wicker" applies broadly to any piece that is made primarily of the woven fibers of a plant. This includes rattan, cane, willow, raffia, and other fibers that are stripped from the plant, cut to size, dried, soaked and then woven or wrapped around a frame. We can thank the Egyptians for the roots of this resourceful craft; stools and other pieces of furniture woven from reeds and rushes were found amongst the treasures sealed away in the tombs of 12th century pharaohs. The Romans borrowed the technique from the Egyptians and began making wicker pieces throughout the empire, and by the 17th century, the whole of Northern Europe was making wicker furniture fairly similar in appearance to what we see today. The appearance of Rattan's undeniable exoticism on the European scene in the early 19th century tells the story of the far reaches of the British Empire via the West Indies and India. The Victorians had their fun using the flexibility of the medium to carry out their elaborately curling motifs. Then, in the middle of the 19th century, we see wicker furniture making the jump across the pond to America, where we promptly mechanized the craft and, naturally, mass produced it. Modernists in the 20th century explored caning as an alternative to upholstery, and so wicker began to take yet another stylistic turn. This console table gets a fresh look paired with modern artwork, and feels up to date with its understated color, and slimmed down proportions. It's an easy choice for a coastal space, but with the right playmates, we think it could also work as a bar in an eclectic dining room. 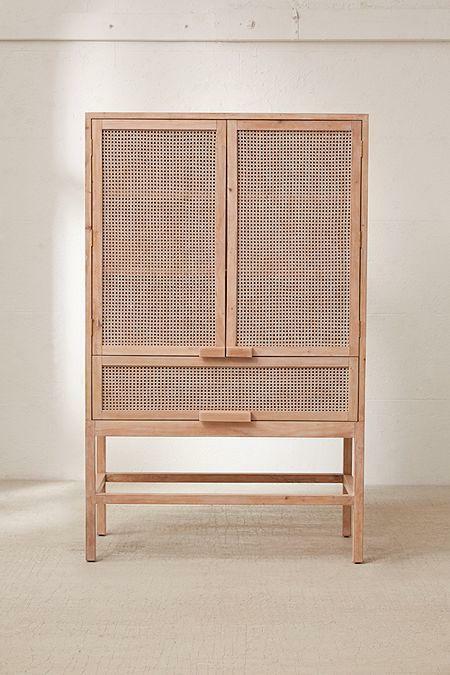 Gorgeous natural wicker lends itself well to the lines of this classic modern piece. We love the nod to Danish designer Verner Panton, whose famous chair is meant to be rendered in colorful polypropylene. We can think of countless uses for a vintage-inspired piece like this - linens, dishes, craft or office supplies. The woven cane gets us every time. This sweet little danish/mid-century inspired stool is a winner with its raffia, gorgeous wood and smart lines. What a dream this bed is too! We would love to see her every single morning, and pretend we are on vacation forever. The end. 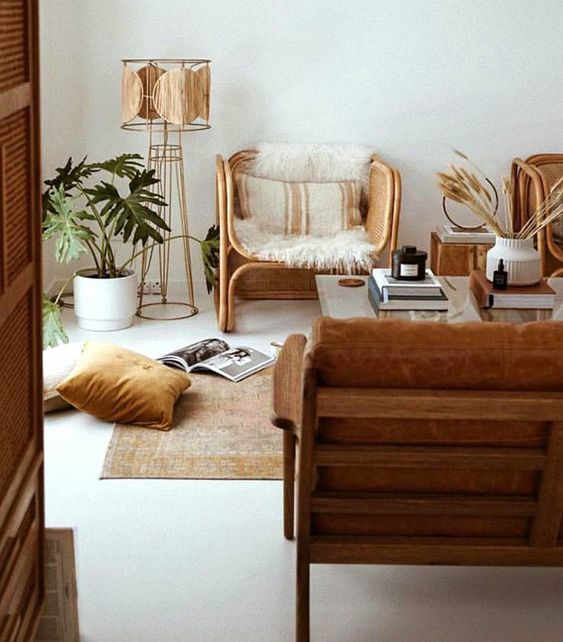 For more design ideas, visit our PINTEREST boards *here* and if you'd like help incorporating rattan or any other texture into your home's style, get in touch to find out more about our design services.